Either you want to get one of these smartphones and you don't know which is best for you or you just want to compare the devices to see the difference and similarities, I guess that is how you landed here. 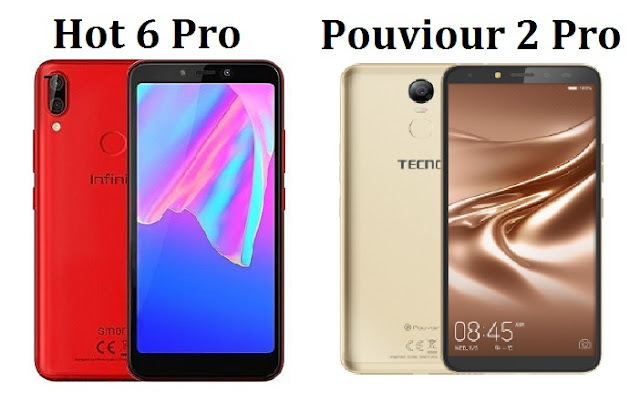 This article is a comparison between the Infinix Hot 6 Pro vs Tecno Pouvoir 2 Pro, both where launched last year (2018). The Mobile Phone comparison is based on phone specs, features, complete technical specifications to help you gain clear details about them so you can make a good choice in case you want to buy. The specification is the first thing you out for in any mobile device, no matter the price and that is why I am starting this comparison from here. From the specification details above, Pouvior 2 has a better front-facing camera as compared to the Hot 6 Pro, while the Hot 6 Pros has a better back camera. Here in Nigeria, power is an issue so the battery capacity is taken very seriously and here the Pouviour 2 have a large 5000mAh battery capacity while the Hot 6 Pros sport a normal 4000mAh battery. They both have the same storage capacity, same ram size and features the same display size. They both have a good performance powered with an Octa-core processor that is again enhanced with Android 8.1 OS. Finally - I will take the Pouviour 2 Pro over the Hot 6 Pro because of the battery capacity and quality selfie camera. Since they both have performed at the same level, then we look out for the difference. Both devices feature almost the same features with a slight change. The Hot 6 Pro support a fast charge which is missing in the Pouviour 2 Pro. The fast charge promises a full day usage under a 30 minutes charge. Aside from that, they are both security conscious featuring a fingerprint scanner and face lock to protect your phones. They also have 4G LTE for super fast internet browsing, No nagging when streaming your favorite video on youtube or stuffing the web. In summary, since the features are not much different, I would still make my choice based on the specifications. The price I guess will make the decision clearer, so I have considered it. The Infinix Hot 6 Pro cost ₦54,000 from Jumia, while the Tecno Pouviour 2 Pro costs ₦43,490 from Jumia also. Taking everything listed here into consideration, like the price, specifications and feature. The Pouviour 2 Pro clearly stands out to me. With large battery capacity and camera quality. However, the Hot 6 Pro is also worth buying expecially if you are an Infinix fan. All in all, you can now make your own choice based on the outlines here.